Washington State Prison is located in Davisboro Georgia. It is a medium security institution that houses approximately 1,548 adult males who have been convicted of committing a felony. The general population at this facility is housed in two and three man cells. 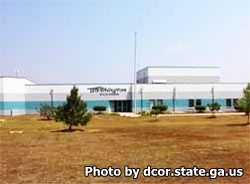 The segregation unit can house up to 92 inmates in double man and single man cells, and is reserved for inmates who are difficult to manage or have safety and security issues. Offenders at Washington State Prison can participate in various work details that include working on a farm, in laundry and maintenance, working in the kitchen, in landscaping, sanitation, composting, and automotive maintenance/repair. Vocational programs at Washington State Prison allow inmates to learn computer technologies, culinary arts, barbering, clerical work, custodial maintenance and more. Offenders are also encouraged to take academic courses that may benefit them, including literacy, adult basic education and the ability for an inmate to earn a GED.